The AAPD recommends children establish a dental home by age one so that they become accustomed to seeing a dentist and their parents can be educated about hygiene and prevention. These early appointments can help overcome fear and avoid serious problems down the road as seen in this case. Leigh was 3 years old when he first came to my office with failed restorations and rampant caries (Figure 1). He had come from overseas where both he and his mother had bad experiences with dentists and developed severe dental-phobia. His mother was delighted to see that her children did not scream during treatment in our office. Figure 1. 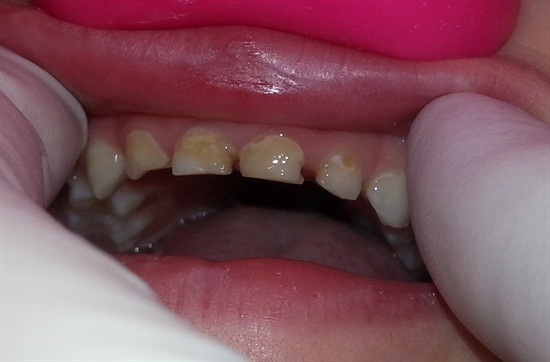 Child presents with failed composite restorations and rampant caries. We have seen the disadvantages of conventional composite strip crowns: degradation of the bond, recurrent decay that may lead to pulpal involvement, and fracture and chipping. Zirconia crowns have been a great addition to our restorative tool box, but they are labor intensive, require aggressive tooth reduction, and take more time. The aggressive prep requires anesthesia, which can contribute to the child’s anxiety, especially when applied to the sensitive maxillary anterior region. A strip crown technique using ACTIVA BioACTIVE-RESTORATIVE requires fewer steps, takes less time, provides a better seal against secondary caries, and provides a more durable and fracture-resistant restoration. First I trim and pre-fit Nowak strip crowns so they are even with the sulcus (Figure 2). Because the prep in these cases is usually quite minimal, I typically do not need local anesthetic. I prep the teeth with a #4 or #6 round bur, slowly removing decay with short light touches. Incisal reduction is usually unnecessary, and I avoid it whenever possible. If needed, I use a very fine diamond to refine, shape and open contacts. I only work 2-3 seconds at a time and keep a 2×2 gauze under the teeth for children who are uncomfortable with the water spray and suction. Figure 3 shows the final prep. I apply a self-etching bonding agent, light cure, and fill the strip crowns with ACTIVA BioACTIVE-RESTORATIVE. I usually seat the central incisor crowns first, light cure, and then the laterals. I remove the strip crowns with an explorer, and there is very little finishing required. I use Sof-Lex disks (3M) for the incisal and a fluted carbide at the gingival margin if necessary. This case took less than 20 minutes and looks great (Figure 4). Leigh is pleased with his smile and asked if we could fix more teeth. No anesthesia, no tears, and a happy child looking forward to his next visit to the dentist. Figure 4. Finished case. No anesthesia, no tears. Dr. Simchi is a board certified pediatric dentist in private practice in Elmwood Park, NJ. As one of ten children and with five of his own, he is well suited for his chosen specialty. Do you have a Heroic Dentistry story to share? Please send materials to feedback@pulpdent.com.